I’m a big fan of being active within the graphics community, especially when it comes to car wraps. When recently invited to participate with the 3M team at an upcoming Grimco event, celebrating the opening of their new East coast distribution center- we were ready to assist. 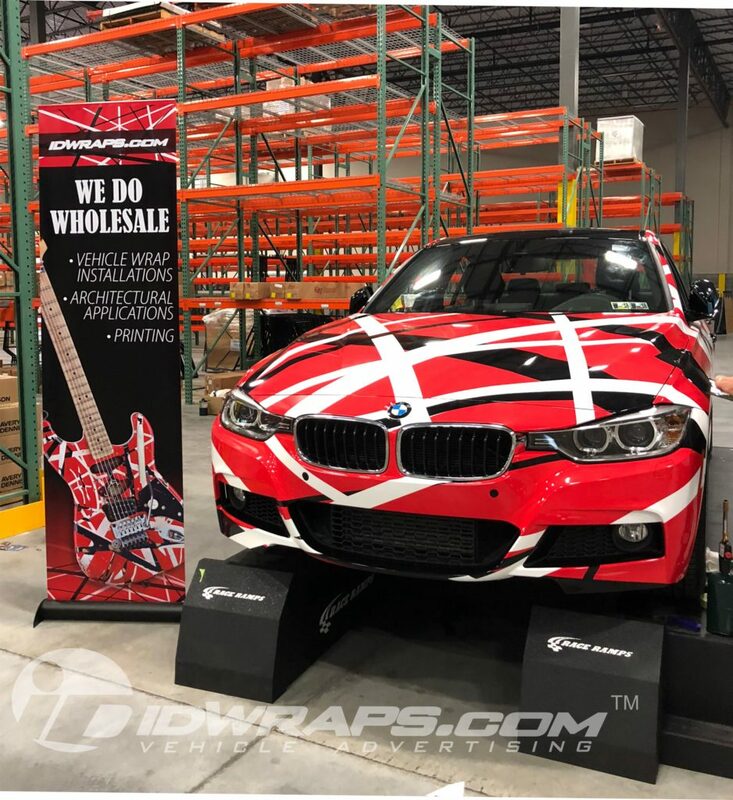 Regional management at Grimco was looking for an interesting late model vehicle to be wrapped as part demonstration/ part wrap installation class to be exhibited throughout the day’s event. With just 7k miles on it, my recently purchased BMW 328i XDrive with M Style package was an excellent fit for a BMW custom vinyl wrap. A car wrap on our own company vehicle is always a tremendous challenge. Somehow, we are always flowing with ideas for our clients projects. When we wrap our own- we often stumble a bit. The challenge is that you always want to take the concept to a high level with a concept which has not been done. Sure, it’s easy to creep on Instagram, but we’re not going out like that. While at a total loss for a new idea- the fruition of ingenuity came to me on the radio. I found myself in my car when “Aint Talkin’ Bout Love” came across the local rock station. Naturally, the volume was turned up way up and the vision of Eddie Van Halen’s “Frankenstein” guitar came to mind. Alas, this iconic guitar theme was our destiny. National installation and services available near you! The show was well attended and the crowd surely began to build as the car was visually transformed with a BMW custom vinyl wrap. Throughout the application, the IDWraps team along with 3M representatives Nate Pace, and Cooper Abrams answered questions while explaining the various techniques being deployed on the BMW as well as applications for other car wraps. Nate was also performing various knifeless techniques on Tom Sweeney’s Dodge Charger. Tom is Grimco’s Northeast sales manager whom coordinated the event along with Rusty Reidimiller, and Nick Filanchino. A crowd favorite car wraps demonstration was the rally stripes which require the use of 3M’s Tri Line Knifeless tape. From under the race ramps- my Bose Bluetooth speaker was rockin’ out Van Halen’s greatest hits all day, which created an level of excitement to the fun and tied the exhibit theme together.